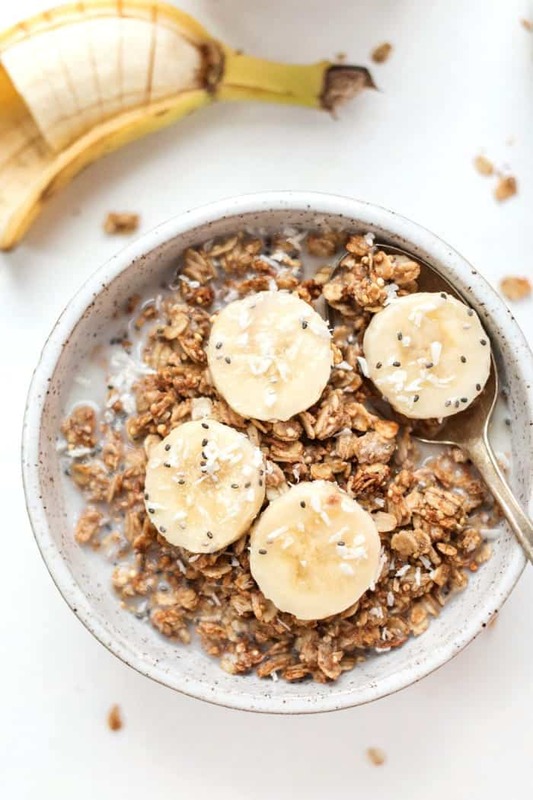 This Peanut Butter-Banana Quinoa Granola is a quick, delicious recipe for perfect gluten-free vegan granola. And it's filled with fiber, protein and healthy fats to keep you fueled all morning long! You know when you bake something for the first time, and it comes out of the oven smelling amazing, and you know you've just nailed it? That's what happened with this quinoa granola the first time I made it. It's been almost 5 years since I first created this recipe and it's only gotten better the more I make it. 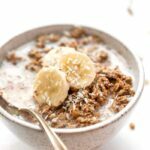 It's flavorful, it's easy, it's healthy and is arguably one of the best vegan granola recipes I've ever tasted. I love that it's full of crunchy oat clusters, has that mild sweetness of banana and TONS of peanut butter flavor. If you haven't made it yet, you're in for a treat! Of course, it's hard to get more classic than the peanut butter and banana combo, especially for breakfast. Which is exactly how this recipe came to be. I was back in Vermont visiting my parents for a long weekend and I was having a hankering for granola. 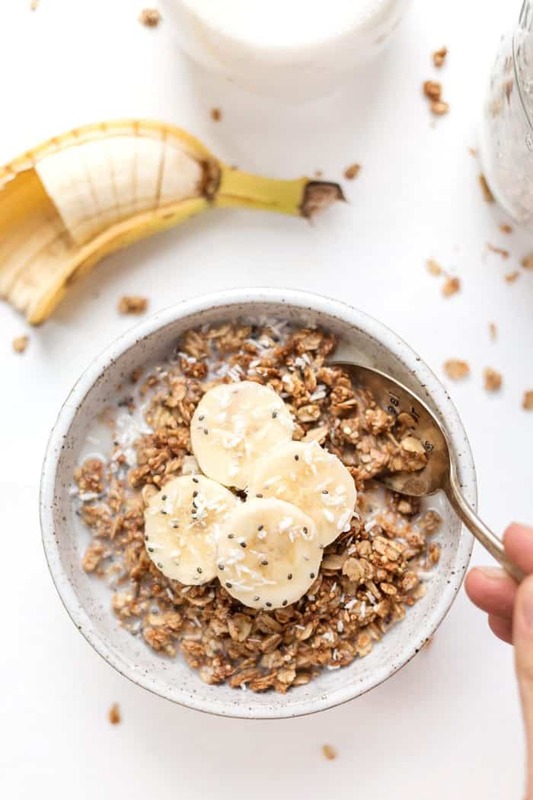 But I was feeling somewhat lazy and couldn't decide between spending the time to make a big batch of homemade granola or just having a piece of gluten-free toast smeared with peanut butter and topped with sliced banana. 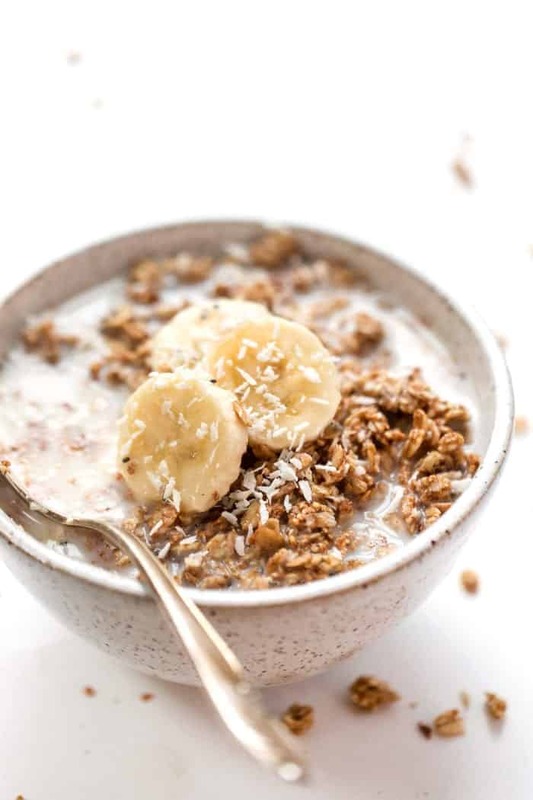 As I sipped on my matcha latte, I realized granola was the only thing that would satisfy that craving, so I decided to mash these two together and this Peanut Butter Banana Quinoa Granola was born. It's delicious. It's easy. It's customizable based on what you have in your pantry. It's just the right balance of peanut butter and banana. It's crunchy and sweet. And it's by far my favorite granola recipe ever. Now quinoa might seem like a strange thing to add to your granola, especially uncooked, but I promise it's delicious! It adds a nice little crunch, makes it a bit crispier and gives the granola a little boost in protein. 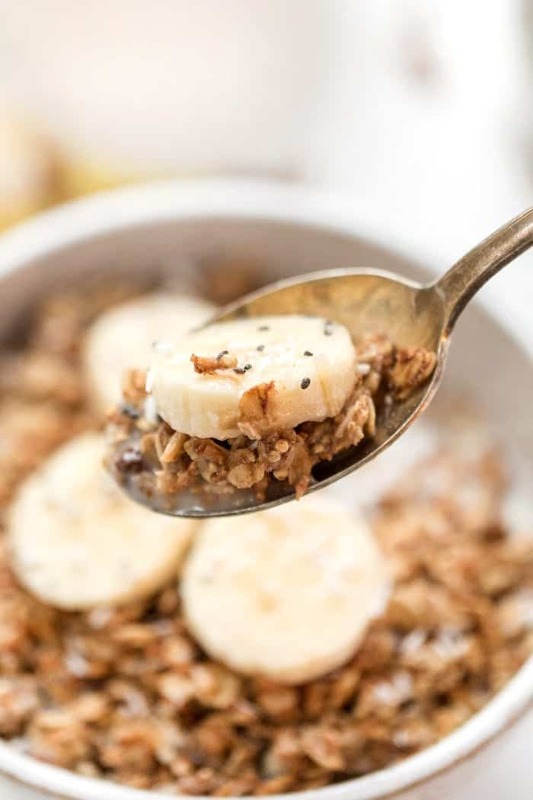 That combined with the oats, which are high in fiber, coconut and peanut butter which are high in healthy fats, this peanut butter quinoa granola definitely makes for a balanced breakfast (or snack!). 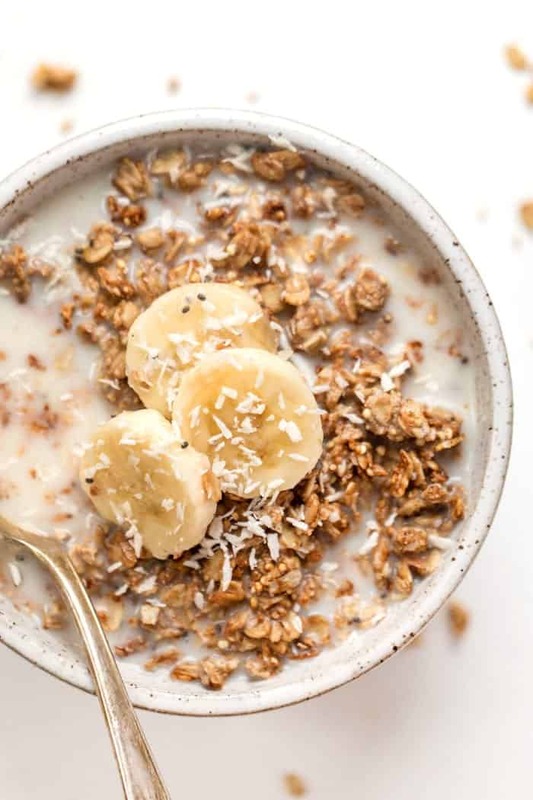 And of course, granola is also a portable option for snacking! I used to like keeping some hidden away in my desk at the office, in my car for long road trips and even in my gym bag. You just never know when you'll get hungry! General rule: use the same proportions and you're good! And that pretty much does it! I'm turning it over to you ♡ I can't wait to see your recreations and be sure to come back to this post and let us know how it turns out! Or if you make any substitutions, definitely share those as well — your tweaks might also help someone else, so share away! Combine all the dry ingredients in a large mixing bowl. In a small sauce pan, heat the wet ingredients together until the peanut butter and coconut oil have melted. Add the wet ingredients to the dry and stir until well mixed and all the ingredients are coated. 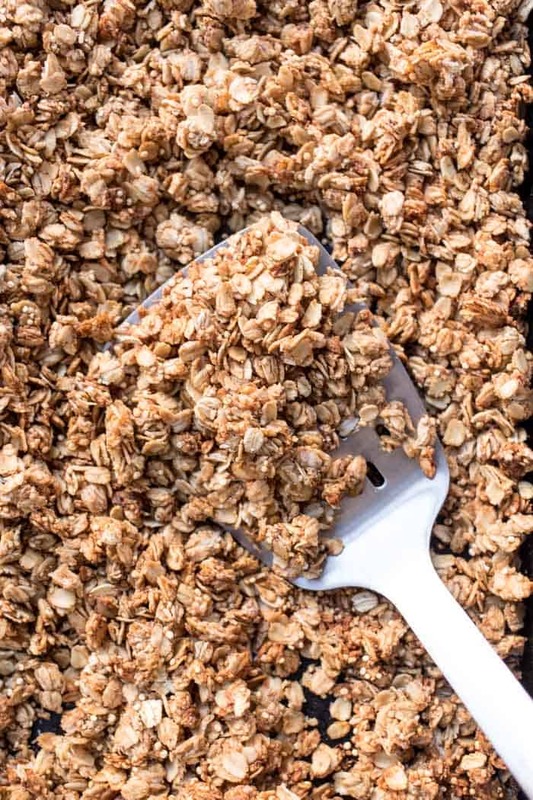 Separate the mixture onto two baking sheets, and bake for 30 - 35 minutes, until the granola is starting to brown. I recommend stirring and flipping it every 10 minutes to ensure even cooking. Let cool completely then transfer to an air tight container. Store in a cool, dry place for two weeks. Just made it, wow it’s good! Every ingredient plays a role without overpowering. I’ve never tried coconut before and was worried I wouldn’t like it too. Is it really 1320 calories per cup? That sounds off to me. Man the best part about this is that it’s legitimately healthy, no sugar overload, and works nicely plain, in yogurt, or various milks. Thanks a ton! Definitely making this a staple meal. Hi! This looks delicious but, I have ALOT of food allergies. How can I adjust for them? I can’t have the salt, sugar syrup, coconut, or oats. Nore can I have any quinoa that aren’t flakes and of the White variety. Nore can I have any other GRAIN except corn or possibly arracacha flour. I can’t have ANY Nut other then cashew/Pb, Tiger Nuts. And only then if it’s NOT cross contaminated with any other nuts, soy, dairy, or other grains. And all the roasted and raw ones are cross contaminated with atleast one of my known allergens. U know Tiger Nuts aren’t really Nuts as you may know. I might know substitutes for all of the specific ingredients I just mentioned above except for the oats. But, can I even create this in a way that’s desirable and non allergenic? If so, how? I would suggest just replacing all those ingredients with things you can eat 🙂 So oats for quinoa flakes, coconut for another nut/seed, oil for oil, and leave out the sugar and salt (although the flavor might be off). 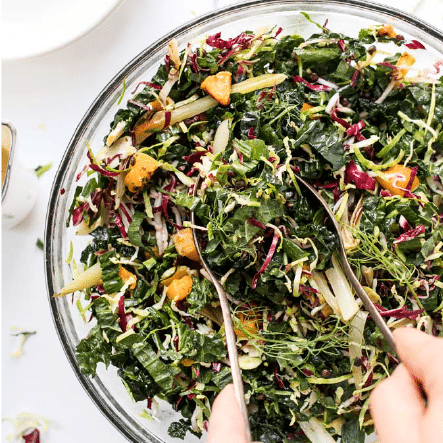 Just go with the proportions that are listed here and use what ingredients work best for you. I might suggest starting with a 1/2 (or 1/4) batch in case you’re not fond of the flavor and don’t end up wasting ingredients. Good luck! Hello! 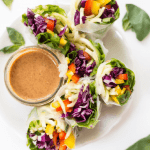 This looks AMAZING and I am planning on making a batch tomorrow! I was curious as to what the serving size is? Is the whole batch 600 calories? Or whats a 600 calorie serving? Thanks so much! Are the calories for the entire recipe or is that truly 1 serving? This looks yummy! Is the 606 calories for the entire recipe? awesome do you think this will work whith peanutbutter -powder as wel? Thanks for your amazing receipts and videos! I’ll definitively try this one this week-end. How many time could this granola be conservated? I made this yesterday and it is amazing! I make my own granola all the time, but I haven’t thought of adding quinoa in there yet. Definitely need to try it! This looks so good! I actually went to the store and bought a massive bag of quinoa from the bulk bins, just so I could start trying your recipes! oh i love that you are making mom’s dish. So thoughtful and looks amazing! This sounds wonderful! 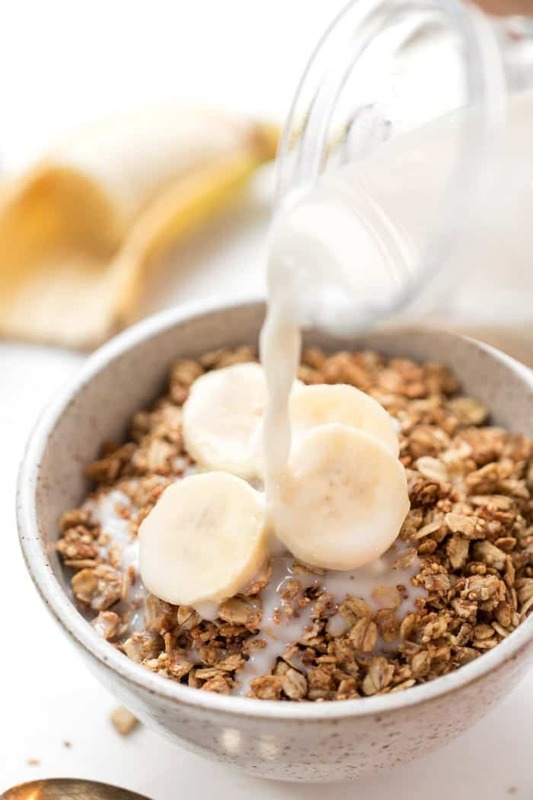 I am always trying to make my own granola now, and lots of new recipes, so this is another one to add to the list! Cant wait to try 🙂 Thanks! I saw this recipe on Pinterest and had to click over. I love quinoa in my granola recipes. Especially paired with peanut butter. So good. Recipe looks great! I have a question though about adding the uncooked quinoa … you do not say to rinse so I am assuming you do not … however you wrote under the “Get To Know Quinoa” tab that the saponins are slightly toxic and act as a natural laxative. Does baking without rinsing change this. I’m asking because my stomach and system is somewhat sensitive and if I do rinse how will adding wet quinoa effect the recipe? Appreciate any insight you have. Hi Linda – actually, most quinoa sold commercially is pre-rinsed so you actually don’t need to worry about rinsing it beforehand. You’re making me realize I need to revisit that page and make that note. Thanks for bringing it up. So, you should have no problem eating the quinoa as is. Hope that helps. 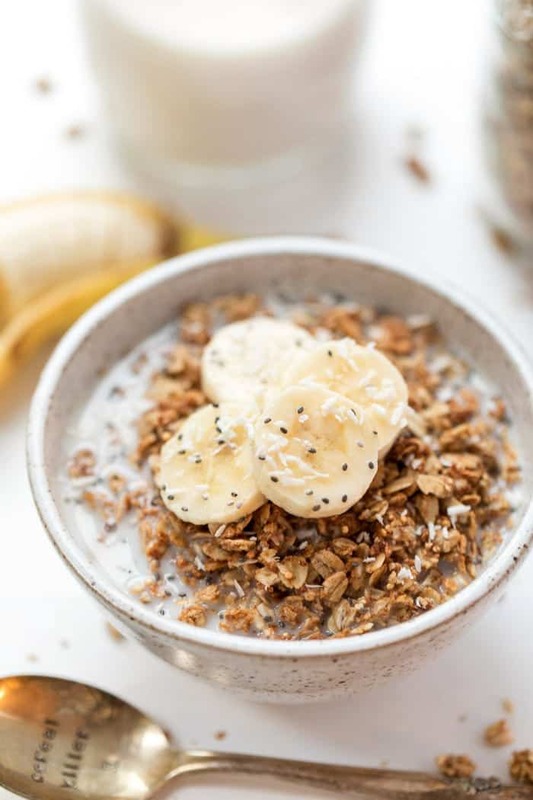 Enjoy this granola – it’s amazing! Can this recipe be turned into granola bars? If so what would I add to it, I love this site and all the great recipes. I believe it could, but I haven’t honestly tried it. 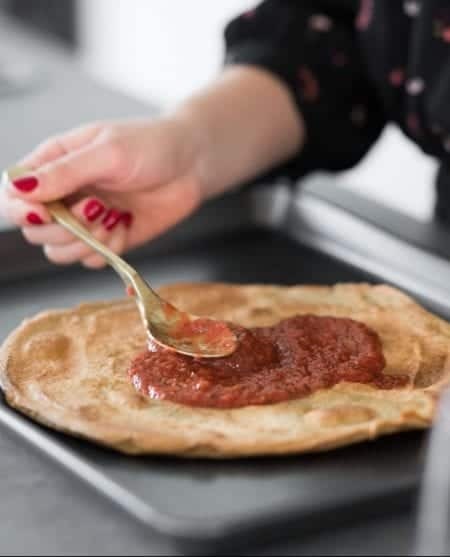 You’d have to add a bunch more ingredients – up the oil, up the nut butter, up the sweetener, bake it longer, etc. The recipe would be quite different, but I think doable! Hi. 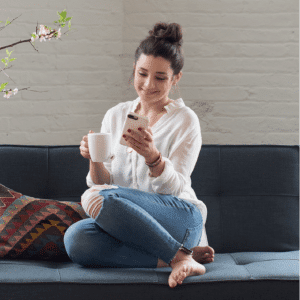 I’m really enjoying receiving your recipe and article emails! They’re wonderful and inspiring!!! 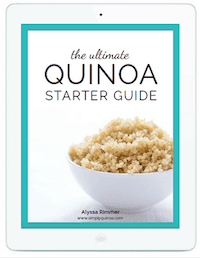 Other than your baking with quinoa e-book, do you have any other titles available for purchase? Thank you.